If you want to know Link building secrets for achieving top Google rankings for your website. Link wheels and link wheel building is the topic that is mostly discussed and practiced in present-day search engine optimization community. Not so long ago, link building was known as the set of any spammy activities (the black hat tactics) for getting better rankings in Search Engine Research Pages. Actually, the unethical and shortcut methods for rank betterment are criticized and neglected as the black hat techniques that often result in penalties and rank loss. You may also advance link building techniques. But, the modern day webmasters have developed a safe, purely ethical and definitely effective link building methods so that no one will have to follow the evil and face the Google penalties. Google is not actually in the favor of spammy manipulation of its search results. That’s why they have developed an algorithm system which is specifically designed to check the sites and catch the spammy practices and delist you if you found guilty. In this following the improper and the shortcut methods of link wheel building is not right for a long-term business success. Here it is necessary to understand that what is a black hat link wheel strategy and how it works? There are many users generated content sites on the internet that can be rank well because of many reasons like domain age and #of an inbound link. Under a black hat practice, a webmaster can post a huge amount of junk content on these sites and then add a large number of links to them. It is done for confusing Google as it cannot understand and differentiate the good or junk content. Even for a short while, a lot of spam links (with the junk content) gives a boost to the SERP of the site. Now, let’s have some information about the outcomes of this traditional and so-called “black hat” link wheel strategy. If the spammy links and the junk content are caught by Google search spiders, your page will be banned; you have to develop a new one. Google will not rank your site while it finds poor content that is complemented with too much forum and blog spam links with them. And this simply means by designing, developing and promoting an absolutely new site. So it is in better health of your business to stay away from a spamming community (i.e. people, blogs, forums or the search engines). No doubt, the webmasters have learned the lessons and accepted that it is best to spread the message online with ethical manners and achieving the ultimate goals. The last few couples of months were full of the dramatic changes that completely modified the aspect of online marketing in the terms of link building. Today matter of concern is “how to get the quality link” instead of “how many links can I get”. There are so many popular stories or inspiring example, are floating around us that have gone from zero to million dollars revenue in a short period of some weeks or months. Some have reached to the top ranks of Google’s search results in the terms of keywords and exploited this stage in a huge monetary profit. And all this is done by following the ethical and Google approved practices of the content marketing and link wheel strategy. If built soundly and implemented correctly, these strategies can work very well and complement your online marketing efforts in the most supportive may. 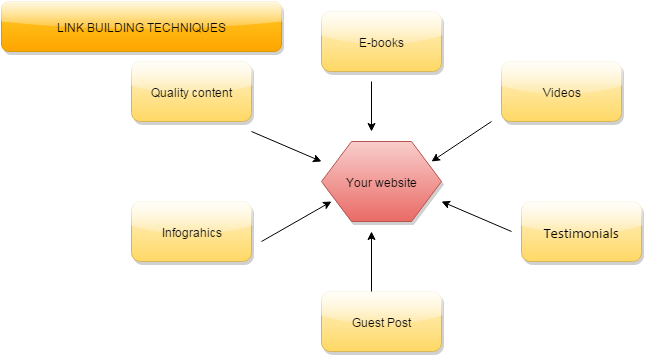 Now, what is the process or methods of an effective and successful link building? These can be easily explained under the given topics. It is said that a great content rules the internet marketing. Focus on creating the stuff that the people really want to read, which they will love to share and want to link with. A blog with superbly informative and educational content simply attracts the other bloggers and websites to link with. Also, try to make it fresh and more often. How to write a great SEO content? How to write SEO content for a blog? Link building is meant by networking and reaching out to the other bloggers, website owners, advertisers, PR and news for building fair business relations and earning huge quality links. It can never be earned while you post your content only once or twice in a month. With more often publishing of new content or its edited version, you need to keep consistent and Impress Google search engine spiders with quality links to your posts. While online magazines always look for and welcome the fresh content, you can use this opportunity to use their’s links, connections, and readers for getting the link backs to your blog or website. With the remarkable number of directories that your site can be found, you will get the trust of search engines. They spread a good word about your article. A thing to be considered in this relation that accompanies with the best; the directory with poor quality or non-SEO friendly approach can never help you in any of your goal. You also have to make efforts for directory submission of the same niche. They are created specifically focused on the basis of a specific topic in the mind. The directory of the same niche attracts and connect sites that are more relevant. It directly affects the Google rankings as it tends to give more importance to the backlinks coming from any sort of relevant site or sites. This also helps positively in the boom in SERPs. Social media are the most popular tending of the generation and it will go on for a long time. Facebook, Twitter, YouTube, LinkedIn, Instagram, Google+ and many more sites are providing a platform for connecting and communicating. They can be used productively for getting or building some really important links. Each link, share, comment, retweet or pin actually is a link to your post. If you manage to keep it real and human it will give you a great help in creating some awesome links. Through link building, a blog post or an article can achieve a great visibility and present on any leading search engine including Google. It was a time when link building was a most criticized and notorious SEO practice due to black hat techniques that were based on manipulating Google and other search engines. But today, in its ethical form, it is highly productive mean of search engine optimization. With proper methods and tactics, a blogger can earn the high traffic, good visibility, and top rankings.